The governments of many countries are now striving to use technology to move official services to the Internet, thereby enabling citizens to enjoy more convenient access. The Taiwanese government has expended significant effort toward adopting technologies for establishing e-government. In Taiwan, all governmental units are non-profit service providers, and all personnel, including e-government leaders, are public servants whose performances do not influence salaries and positions. However, the existing literature contains no in-depth investigations of the important roles played by e-governmental leaders, also the public servants, who direct adoption of online services. This study, therefore, investigates public servants’ styles of leadership as perceived by subordinates during the process of developing an e-government. This study also explores the influence on perceptions from subordinates’ demographic variables, such as age, educational level, gender, and years of service. As a result, this study finds that the e-governmental leaders in Taiwan function better from a transformational style of leadership. However, the public servants’ educational levels have a significant impact on perceptions of direct supervisors’ styles of leadership. Finally, this study suggests encouraging subordinates to participate in on-the-job training to increase abilities and opportunities for undertaking more challenging tasks. Fountain, J. E., Bertucci, G., Curtin, G. G., Hohlov, Y. E., Holkeri, K., Jarrar, Y., Kang, J., Lanvin, B., Noveck, B.S., Obi, R., Stone, L., Walji, A., Larsfalten, C., & Fayad, R. (2011). The future of government: Lessons learned from around the world. http://works.bepress.com/jane_fountain/92. Accessed 23 May 2015. West, D., Noveck, B. S., & Sirianni, C. (2009). 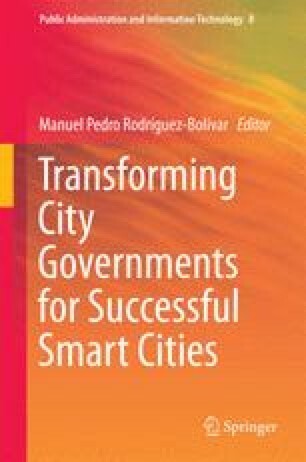 Innovation in government: How to make the public sector faster, smarter and more connected. http://www.brookings.edu/~/media/events/2009/6/17 %20public%20sector%20tech/20090617_innovation.pdf. Yiu, C. (2012). The big data opportunity: Making government faster, smarter and more personal. http://www.policyexchange.org.uk/images/publications/the%20big%20data%20opportunity.pdf.